My husband and I recently decided to move from Seattle to London. This comes as a surprise to us, as well as to many of our friends and family members. You see, even though London is a fantastic city with a much more global presence than Seattle, we’ve been quite happy with our very established lives and careers and home in the Pacific Northwest of the USA. As we disclose this plan, I often joke that we’ve been at 51% and 49% yes about the decision until very recently. So why and how did we decide to take on such a big change? I figured walking through our thinking could be helpful to others who are deciding whether or not to make a similarly large life transition. Here’s a peek into the reasons behind both our excitement and our reluctance, and the strategic steps we both took to research the change and reassure ourselves that it was the right move for our family. While this isn’t meant to be a dissertation on privilege, I will be repeatedly reminding readers of the privileges that allow us to make this decision easily. I think it’s important to explicitly recognize this, because these privileges are not available to everyone and will factor heavily in the decisions you’re able to easily make for yourself and your families. It would be foolish to assume everyone is in the same position as us, and disingenuous to advise someone in a very different position to make a similarly drastic life decision with the same considerations as us given different life circumstances. Why did we decide to move? Before I get to the “how did you make this decision”, I figured I’d tackle the “why,” even though they’re often interrelated. I hope externalizing these thought processes differently can be helpful to different audiences. We definitely had to solve for “why” before moving on to “how” in terms of our own thinking process. A huge factor in committing to this move is not wanting to look back and ask ourselves “what if we’d taken that leap?” We live relatively unruffled lives in Seattle, in a comfortable easy bubble. We own a nice home and manage to pay for it with manageable ease thanks to our two tech incomes. We can afford to Amazon Prime whatever sudden whim we think might make our lives easier. We drive two cars even though we could try harder to ride public transportation, because the local incentives and infrastructure make it simpler and easier to do so. When we flew out to London just to investigate the move, I was immediately refreshed to be in an area with different cultures, different racial groups, different languages, different cuisines and smells and accents–it was incredibly eye opening as to how comparatively homogeneous our corner of Seattle feels by comparison. I don’t want to overly fetishize the concept of diversity as some sort of commodity, as so many fellow privileged white folks do and as I know I can be guilty of. At the same time, I’m acutely aware of having grown up in an extreme bubble of well-meaning whiteness, English-speaking-ness a certain type of upper class yet hippie yet affluent American-ness that’s quietly embarrassed about its lack of actual diversity of thought or influences or experiences, and I want to give our family the chance to break away from that. I was raised in an affluent and largely white suburb of Seattle, where there were TONS of “Think Globally, Act Locally” bumper stickers and, later, far too many of those ugly “Coexist” ones. But how much did we actually coexist? There were a handful of largely secular Jewish families in my community and friend group. I think I had one mixed-race half-black high school pal, of the total of two black kids in my high school class. There were perhaps three or four Taiwanese and Mexican kids, and no south Asian kids I remember. This is in a class of over THREE HUNDRED students. Yeah… We were NOT a diverse culture, though we may have prided ourselves on values that would accept and celebrate any hypothetical diversity our white asses encountered. I learned foreign languages not because they were a deeply ingrained part of my community, but because they increased my perceived academic and professional capital as a privileged white student. I studied abroad and traveled to various other areas, but I mostly visited western Europe where perspectives (and structures of systemic racism) are far closer to the America I grew up in than they are different or challenging. Even though I think my community did a relatively decent job of raising me with values that celebrate and respect cultural and racial diversity, living in a vacuum fundamentally limits your understanding of the world. I inherited a million tiny biases from my upbringing, and I see it now as an adult trying to unlearn so much about privilege, class, systemic structures of inequity… it’s a lot to undo. 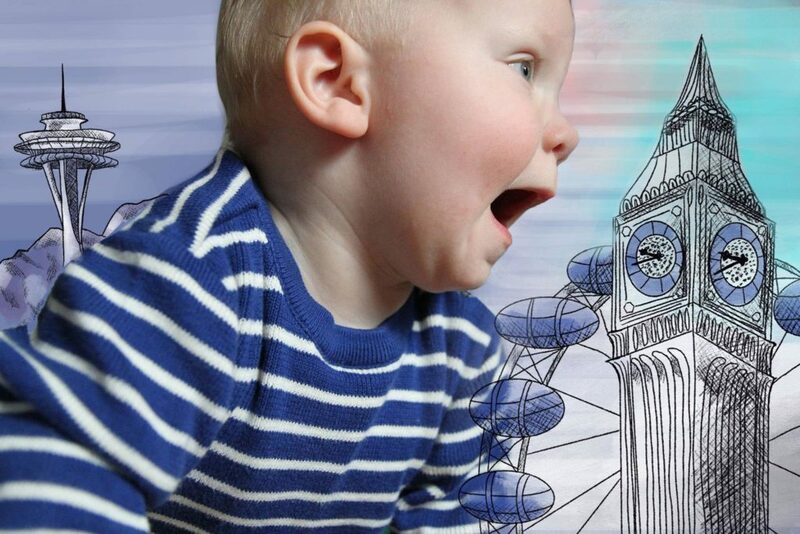 While there’s no perfect way for us to parent our child, we know that we can expose Storm to a world of different types of people in a major city like London. He’ll also have quicker, easier access to other parts of the globe and to other communities than his own white secular parents. Providing a more enriching environment with broader opportunities for understanding and human connection across the race, culture, and class boundaries we were raised with ourselves felt important to us. It felt like a way for us to live some of the values we theoretically espouse but rarely put into action in our Seattle microcosm. That’s not to say we won’t have to try to break those barriers in London too, but my hope and impression is that we won’t have to reach as hard to do so. We are moving from a very expensive part of the USA to one of the MOST expensive parts of the WORLD. We’re also moving with only one secure salary, as I have yet to find a London-based job. Why would we take such an enormous financial risk? Frankly, because we can afford to. We both have an enormous amount of white privilege, which has granted us many opportunities that will make us attractive to employers all over the world. Growing up, I traveled extensively and lived abroad in high school, during college, and after college. This isn’t something I would have been able to pull off without a lifetime of white privilege helping me out (along with a bias for international living from my English-then-Canadian-then-American mother). I also have the privilege of dual citizenship and Grant has the privilege of a fully sponsored visa, not to mention we have a paid relocation package from his future employer. We can trust that our whiteness and the advantages it has afforded us will make for a smoother transition than many people would be able to make. We trust that our charm, social ease, educational background, career experience, and language opportunities will be sufficient to eventually smooth over any anti-American bias we encounter abroad. We wouldn’t be so at ease about this without the systemic advantages afforded to us all by whiteness and structures that disproportionately advantage white, native English speaking people like ourselves. Realistically, we probably won’t hate London. I’m half English, carry dual citizenship, and have lots of extended family across England. My husband and I have always loved the UK when we’ve visited and have been charmed by the architecture, character, accents, rolling green hills dotted with sheep, functional public transportation, you name it. But even if we somehow still hate living there, we are privileged enough to be able to “undo” this decision if we need to. We are being relocated at no cost by my husband’s new employer, who head-hunted him for this role. The company also sponsored any visas our family needed, is covering our temporary housing, and pairs us with a relocation specialist to help us find a great London home and placement in daycare for our child. While we would have to pay back relocation costs if we were to leave before a year is up, we are certain we can make it that long in the unlikely event that this is ends up being a terrible life choice for our family, and we are confident it won’t end up being so terrible that we want to leave that quickly. We can rent out our home in Seattle for a decent price that allows us to cover our mortgage and at least some maintenance/property management costs, so we have somewhere to come back to if we decide to return to Seattle after a few years. We were able to make this transition to one of the most expensive cities in the world because there are many structures in place that make it much easier for us than for many people who might want to live in London (or make any kind of big move). While we’re very sad to leave our friends and family members in the Seattle area, we landed on the decision to move anyway for a couple factors. If we ever decided to relocate to England permanently, we could probably talk my English mother into making the jump too. In the meantime, we hope to encourage her and my father to visit a few times and video chat a whole lot more. While we would have been devastated to leave our friend community some years ago, we just don’t see pals as often as we used to now that we are parents. When we do see friends, it’s our most kid-loving and/or kid-connected pals who make the cut, and it’s never as often or as focused or as grown-up or as unencumbered or as carefree as it used to be. Friendships take a bit of a backseat especially during early parenting years, so it felt like a surprisingly manageable time to leave friendships behind since they’ve already been “on hold” since our child erupted onto the scene and fundamentally changed how we spend our time outside of work. Digital connection helps so much! It’s way easier to stay in touch online than it used to be, even though it still requires effort (just a different kind). Our East Coast family isn’t that much farther away! We have tons of folks in the DC area we already don’t get to visit as much as we’d like with a toddler in tow. While it’s a couple hours longer to fly from there to London than it is to fly from there to Seattle, it’s a manageable difference (with an admittedly larger mental gulf to traverse. Somehow needing a passport makes it feel disproportionately farther away.) We hope to visit more and convince them to do so as well, and we hope London is an attractive lure to entice this change. Again, privilege. We are sure we can afford to do things like buy iPhones/find good data plans for elderly relatives/start up a travel costs slush fund/etc. to facilitate easier visits. How did we make this huge decision? I think the tactical actions we took helped us arrive at a clear decision. I hope writing out this methodology is helpful to others considering big life changes, even though I know not all of these tactics are accessible to everyone. My husband received an offer before we had ever met the team he’d be working with in person, or even found out what the project he’d be working on was. (This is relatively unusual for the video game industry, and moreso for a creative position such as his.) So our first step was insisting on both of us flying out to meet the team, get a feel for everyone in person, sign NDAs to learn about the project, and revisit London for several days with a lens of relocation and not just tourism. Thankfully, this was a natural part of the process for his future employer as well, but not every opportunity will make this option available. While our son fell ill and I therefore delayed my trip by a couple days, we had the luck of him getting well enough to leave with a sitter, and the privilege of being able to afford a trusted sitter who could stay with him for a few nights for our first ever absence from him. I can’t stress enough how important this “scoping tour” was. When I moved to Mexico City after college, I couldn’t afford to do this. When I went to college on the East Coast after being raised in Seattle almost all my life, I didn’t take the time to do this (and definitely should have, as we did have the privilege to do this in my household if we had made it a priority). When I studied abroad in Barcelona, I had previously been to Madrid for a shorter study trip but had never scoped out the city of Barcelona before. Heck, when I went on a brief community service trip to Nicaragua with my high school, the organizers prepared me for months (also a great privilege) but I’d never actually been anywhere with such a gap in standard of living compared to what I was accustomed to. Being able to check out the opportunity we were evaluating is huge, huge, HUGE. Plenty of people are stuck with interviewing via Skype and then discovering to their unpleasant surprise that they aren’t actually excited by the climate/city/neighborhood/commute/etc. they moved to. As someone who had had both good (Barcelona; privileged study abroad program at fancy university) and bad (Mexico City; broke post-college post-breakup desperation job) international living experiences, I knew that things with this move had the potential to be soul-crushingly depressing. However, we assessed where we were at in life, with a stable happy marriage in which we are (barf, I know) truly each other’s favorite person to hang out with, a healthy well-adjusted child who would handle the change well, and for whom we could easily find child care without requiring any special needs. My husband and I are also both good connectors who forge new relationships easily when we actually try, and I personally excel at figuring out how to leverage my network (more on that in a bit) and unearth friendly and helpful contacts in a new place thanks to this digitally connected area. We also had a decent community, unlike when I moved anywhere else. I have family in England and we have quite a few social and professional connections. No matter how things went, we figured we could proactively connect with friends and family in and around London and make sure we weren’t too isolated or culture shocked or depressed. Making it one year or more would be manageable, and we’d always have our home to come back to in Seattle if things didn’t work out as we hoped. The internet. Plenty of stuff we wanted to know was researchable online via expat guide sites or Facebook groups. My extended family in London. I wanted to float the idea of living there to the folks I was closest to, both emotionally and eventually geographically, to put out feelers for how it would be to live closer to them. Everyone was warm and encouraging and enthusiastic–which is what I expected, but it never hurts to confirm! Would I happily find work there? Probably, but be careful of West Coast tech companies with London offices that expect you to work a West Coast schedule. (This fits the description of many jobs I’m applying to, so it was helpful unsolicited advice!) Interview closely for this kind of culture detail to figure out what balance of weirdly-timed calls you’d find acceptable given where you’re at in your life. While this was specific to the Microsoft roles I was investigating at the time, it seems like good advice for anyone in a similar position. What should we bring vs. get rid of? Ditch literally all small appliances; don’t bother with transformer type converters. All the appliances will eventually die faster than they would have otherwise, and your’e better off just selling them and buying new stuff. Lots of expat groups facilitate this so it’s not a huge deal. Only bring your nicest furniture that can turn around tight corners. Could we deal with the transportation? Yes – online grocery stuff is more robust there, and people might Uber or Car2Go for the occasional trip but train service is great and worth it (though expensive and necessary to budget for). Traffic is awful and it’s likely not worth getting a car even if you end up with somewhere reliable to park it (also unlikely). Whenever I take a Myers-Briggs type personality test, I fall right between the E for Extrovert and the I for Introvert, usually leaning ever so slightly more I. This surprises nearly everyone who knows me, since I tend to turn on the social vibe when I’m in a social setting, but I actually need a lot of down time to feel recharged and un-harried (I suspect this has a lot to do with growing up as an only child very accustomed to plenty of solitude and personal space). Despite my preference to kind of retreat and cozy up with my family, I knew I’d need to turn on my social charm and savvy in order to establish a new community in London. So I’m currently being far more brazen than is comfortable about asking people for London introductions, and once I actually get there, I’ll probably have to be far more social than is comfortable when it comes to making good on various vague offers to grab a drink or a coffee sometime. This means pushing myself–enduring the guilt of making my husband tackle bedtime for our kid solo (which we rarely foist on one another–parenting is a lot more tolerable with a buddy) in order to meet up for that pint with someone I only know from the internet. It means doing the mental and logistical work of finding childcare, and then paying for it, just so that I can grab lunch with an old Microsoft contact who moved to London in case it ends up being a fruitful professional or personal connection. It means turning all those little “mostly just for politeness” pseudo-invitations into actual dates, by doing the work of following up and suggesting times and locations that are convenient to the other person rather than myself. This is all exhausting, extroverted work–but I know it’s what will be required of me if we want to maintain a healthy happy social life and mental health balance in the long run of our London tenure. You may see from this blog post that I’m a bit of a planner, perhaps unkindly called a ‘control freak’ and more professionally described as ‘risk averse’ with a penchant for ‘forecasting all outcomes’ and ‘developing contingency options’ and other resume-speak. The biggest stresses for me in this transition were around realizing that we simply couldn’t do everything ahead of time. It’s harder to find a job from another country than when you’re on the ground and can meet people in person in the correct time zone. So even though we both would have been much comforted by my securing a London-based employment offer before we moved there, that simply didn’t pan out and I had to trust that it would work out in the long run somehow. We can’t downsize all our furniture and “stuff” right away because we don’t want to sit on the floor in a dark living room for too long. :) We aren’t ditching certain possessions until the bitter stressful end, even though it’ll make our exit more hectic, because it’s worth it to sleep soundly on our normal bed for X more weeks and it’s worth keeping a sense of normalcy in our home for ourselves and our little one as long as we possibly can. We can’t go apartment-hunting ahead of time because the London market moves quickly enough that anything we found would be snapped up well before we were able to see it in person (a must for my final decision). We can’t seek daycare placement for Storm because we want to make sure we know where we’re living and don’t have a massive daycare commute. Some details just HAVE to wait, not just until we get there, but until we get there, settle into temporary housing, get over jetlag, schedule apartment visiting days, investigate childcare to make said days easier, vet said potential child carer and related commutes, and finally commit to either taking a toddler with us to look at apartments or trusting a little-known stranger with said toddler. We couldn’t give specific notice at work, daycare, to our friends and family, etc. until my husband and Storm had their visas approved, which could be forecasted but not perfectly predicted ahead of time. We couldn’t see off everyone we wanted to see off because our lives only fit in so much (and there is now a massive snowstorm forecasted on the day of our harried final sendoff party). We couldn’t fix up every little house thing to make our home into the perfect rental because we couldn’t predict what would make future tenants willing to pay what we hope to get per month. Not being able to predict or plan is tough, but in many ways, this feels like the giant “product launch” that is parenting, haha. We could amass baby-specific supplies when I was pregnant, and ask other parents for advice, and carve out as much in our life as we could that might help facilitate an easy transition into parenthood. But nothing TRULY prepared us for the reality shift that came when our kid entered the world. Many things have stayed surprisingly similar, many things have been completely upended, and nothing is quite how I expected or feared or planned. So on some level, that’s London, too–I guess we’ll see what awaits! Now that I’ve gotten skilled at interior design over the course of our eight years of home ownership, I’m much better equipped to select a great rental dwelling and make it look fantastic. It helps that we’re getting rid of much of the furniture we owned anyway and starting from scratch, since I’ve learned that fitting your former furniture to your new abode is often not as successful as you’d like. While I’m not a huge fan of paring down belongings for the sake of it, I admit that we have a tendency towards clutter and maximalism. Being forced into getting rid of a lot of things is as refreshing as it is exhausting to deal with. We will have so many more travel opportunities! We can see parts of Europe that we’ve only dreamed about because we weren’t previously willing to deal with the nine-hour flights just to get there. We can pop away for bank holiday weekends and the like on very cheap and quick flights. Our kids will learn to be resilient in different ways, such as handling themselves on public transit and said airline flights and on having to walk to the park instead of drive. Maybe I’ll somehow finally score that perfect vintage Burberry trench in a charity shop somewhere. I’ll get to use my multilingual skills much more often than in Seattle. We’ll have an exit path if the US erupts in political flames, assuming Britain doesn’t. We’ll now be more open to the idea of living outside of Seattle if a cool career opportunity arises in another city/country, which is healthier for our long-term career prospects. I’ll look back and be glad our family took on this challenge, even if it’s tough at the time. There you have it! What big challenging decision are you trying to make for yourself? I’d love to hear if you found this helpful!